This article we chose specifically as it shows both sides to a very different story that history has uncovered to be more than just what we were led to believe. The article is written by Ingrid Weckert who no doubt never intended for her article to end up here, but it has, so thanks. The story we were given at school, and the way this particular event has been portrayed is quite different from the standard types of things people do, whether ordered to do or out of spontaneous reaction to an event. Ingrid here sheds some well needed light onto ‘Crystal Night', the night where everything changed. ‘Crystal Night' is the name that's been given to the night of 9-10 November 1938. In almost all large German cities, and some smaller ones that night, store windows of Jewish shops were broken, Jewish houses and apartments were destroyed, and synagogues were demolished and set on fire. Many Jews were arrested, some were beaten, and some were even killed. The “Reich Crystal Night” (Reichskristallnacht) was one of the most shameful events of National Socialist Germany. Although the Jews suffered initially, the greatest harm was ultimately done to Germany and the German people. Even people who are sympathetic to National Socialism cannot understand how this event could have happened. Julius Streicher, the so-called “number one Jew baiter” [note 1] for example, was shocked when he first learned about the demonstrations and destruction the next morning. The all-important question is: Who was responsible for the incident? It is generally accepted, especially by contemporary historians, that the Nazi gang organized and carried out the pogrom, and that the chief instigator was Propaganda Minister Dr. Joseph Goebbels. The truth of the matter is that Adolf Hitler was so disgusted by the incident that he forbade anyone from discussing the matter in his presence. Dr. Goebbels complained that he would now have to explain this terrible affair to the German people and the world, and that he simply did not know what kind of credible explanation to give. If he had actually been responsible for the Crystal Night, he surely would have had a well-prepared explanation. The explanation he gave on the morning of the 10th was extremely unconvincing and was generally not believed by the German public. During my study of this subject, which resulted in my book on the Crystal Night, Feuerzeichen, I found many facts which do not agree with the generally accepted thesis. On the contrary, the evidence which I have found gives a completely different picture. In early October 1938 the Polish government announced that all Polish passports would become invalid at the end of the month unless they received a special stamp before then, obtainable only in Poland. This measure was meant to rid Poland effectively for all time of all Polish Jews living in foreign countries, most of whom were in Germany. Many of the approximately 70,000 Polish Jews living in the Reich at the time had arrived after the First World War. Of course, the German government now feared that it would have to permanently accept these 70,000 Jews. The German government tried to negotiate this issue with the Poles, but they flatly refused. The Polish border officials were surprised when the first train loads arrived at the border, and they let the Jews enter Poland. At about the same time, the Polish government was deporting German Jews back to Germany. The next day, 29 October, the Polish and German governments suddenly agreed to stop the deportations of their respective Jewish populations to each other's countries. The deportations were completely halted that night. Among the Polish Jews deported was the family of Herschel Feibel Grynszpan (Gruenspan), a 17-year-old then living Paris. What followed next is generally reported either incorrectly or very one-sidedly. On 7 November Grynszpan went to the German Embassy in Paris and shot Embassy Secretary Ernst vom Rath. It is said that Grynszpan did this because he was furious over the deportation of his family. The truth about his motivation is very different. It is also claimed that the German population, upset by the news of vom Rath's death on the 8th, organized anti-Jewish demonstrations, destroyed Jewish stores, and demolished or set on fire all the synagogues in Germany. Demonstrations and destruction did take place, but the truth is that they were not organized by the German people and did not affect most of the synagogues in the Reich. Finally, it is claimed that the Crystal Night was the beginning of the extermination of the Jews in Germany. This is entirely false. Before explaining how the events surrounding the Crystal Night differ from what is generally believed, I must first give some background information about the peaceful years in Germany after Hitler came to power in 1933. Anyone who is aware of the true situation in Germany during the Third Reich era recognizes that the Crystal Night episode was quite extraordinary. It was a radical aberration from the normal pattern of daily life. The outburst was not in keeping with either the official National Socialist Jewish policy nor with the general German attitude towards the Jews. The Germans were no more anti-Semitic than any other people. In fact, Jews who had to leave other European countries preferred Germany as a place to live and work. Within the National Socialist-Party itself there were two distinct anti-Semitic factions. One was scholarly and one was vulgar. The scholarly faction was centered around the Institute for the Study of the Jewish Question. It published several journals and gave lectures to civic and political groups. Its activities were consistent with the policy of peacefully removing the Jews from Germany and resettling them elsewhere. The SS was totally committed to this policy and rejected vulgar anti-Semitism. The vulgar anti-Semitic faction tried to influence popular feeling. The chief exponent of this approach was Julius Streicher, who published the unofficial monthly Der Stuermer. It used crude caricatures to portray Jews in the most horrible way in an effort to convince readers that the Jews were as evil as Satan. For years the motto “The Jews Are Our Misfortune” appeared on the front page of every issue. Der Stuermer often employed improper and undignified means to make its point. German National Socialism basically regarded the Jews as non-German aliens who had proven themselves destructive to any nation that permitted them to dominate. Therefore, the only way to prevent further problems was to separate the Jews from the Germans. In other words, they had to emigrate. On this point the National Socialists and the Zionists were in full agreement. Although the Jews made up less than one percent of the total German population in 1933, they had power and influence in finance, business, cultural affairs and scientific life far out of proportion to their small numbers. Jewish influence was very widely regarded as harmful to German recovery after the First World War. No legal measures were taken against the Jews in Germany until after the international Jewish “Declaration of War” against Germany, as announced, for example, on the front page of the London Daily Express of 24 March 1933. This “declaration” took the form of a worldwide boycott of German goods. A week later there was an officially sanctioned boycott of Jewish shops and stores throughout Germany. This action was in direct response to the international Jewish boycott of German goods already in effect. However, the German response was a rather absurd affair and it was therefore limited to a single day, the first of April 1933. Hitler and Goebbels privately recognized that the German counter-boycott was a failure and would only turn people against the new government. Furthermore, this one-day action came on a Saturday, the Jewish Sabbath. Religious Jews took malicious pleasure at the discomfort of the Jews who normally kept their stores open on Saturdays and were now, in effect, forced by the government to obey the Jewish law against work on the Sabbath. The National Socialist regime thereafter sought to diminish Jewish influence and power by strictly legal means. The first German law which could be considered anti-Jewish was dated 7 April 1933. Although the legal status of the Jews was restricted, each and every Jew knew what his legal rights were and to what he was still entitled. There were no secret or extra-legal measures against the Jews. Ironically, it was precisely the official discrimination policy against the Jews which reduced the effectiveness of anti-Semitic propaganda to almost nothing. The Germans are a generally fair-minded people. When Germans saw their Jewish neighbours being treated unjustly, they considered that far worse than the dangers which the Jews supposedly represented simply because they were Jewish. Furthermore, the examples of Jewish criminality and perversion described in Der Stürmerwere widely regarded as exceptions to normal Jewish behaviour. The average German was convinced that the Jews whom he knew personally were completely unlike the criminal types sometimes described in newspapers. In my home town of Berlin most of the doctors and lawyers were still Jewish. And even the public health officer for children in the district of Berlin where my family lived was a Jew who kept this job throughout the war. I still remember one day when my mother returned from her Jewish doctor. She told us that she hadn't been able to see him because he was no longer there. He had been taken away-hauled off the previous night. My mother was very upset. A crowd of people had gathered outside his house. They were all shocked, and they discussed the injustice of this measure quite openly. My parents later talked about what had happened, and they both agreed that the doctor had never really done anything wrong. Their reaction was typical. A few days later our family paediatrician, who was also Jewish, was likewise taken away. At the time I did not know what it meant to be taken away. It was only many years after the war, when I started reading the Holocaust literature, that I learned that I was supposed to believe that to be taken away meant deportation to a concentration camp and probable death. But like so many thousands of others, these two doctor families were not exterminated. One summer day in 1973, as I was walking through the streets of the German quarter in Tel Aviv, I came upon the name plates of both doctors on the doors of two houses. I immediately tried to visit them and found out that both families had migrated to Palestine in 1939. Although one of them had died in the meantime in Israel, I was able to speak to the other. He remembered my father very well and explained that when he and his family were arrested, they were taken to a camp and given the choice of either signing a document declaring their intention of emigrating from Germany or being taken to a labor camp. He and his family chose to emigrate. In fact, most German Jews survived the anti-Semitic measures quite well. That does not mean that those measures were not unfair to individual Jews, but they could usually manage to live with them. The Haavara agreement made it possible for any Jew to emigrate from Germany with practically all of his possessions and personal fortune provided that Jews could deposit all of their assets in one of two Jewish-owned banks in Germany which had branch offices in Tel Aviv and Jerusalem. Upon arrival in Palestine they could withdraw their assets according to the terms of the agreement. The German capital of these two Jewish banking firms was guaranteed by the German government. Even after the war these assets were fully available to the Jewish owners or their representatives If a Jew did not wish to emigrate immediately he could transfer all of his personal assets to Palestine where they would be safeguarded by a trustee while he remained in Germany for an indefinite period with emigration as his eventual goal. In the meantime his personal fortune was safe outside of Germany. Even poorer Jews who did not possess 1,000 English pounds were able to emigrate to Palestine with credits provided through the Haavara. The British authorities generally required minimum assets of 1,000 pounds for each immigrant to Palestine if he was not entitled to a so-called worker's certificate. Only a limited number of these certificates were available and they were issued only to persons with special job skills. In addition, Jews emigrating to Palestine were exempt from the so-called “Reich flight tax,” which all emigrating Germans normally had to pay. However, the Jewish companies which arranged the transfers charged the emigrants a fixed percentage of their total assets. The Haavara agreement remained in operation until the end of 1941 when the United States entered the war. I am always amazed whenever I read books about the Third Reich published after the war. Most give an almost totally false impression of the reality of the Third Reich. The Germany of Adolf Hitler was not the Germany described by such books. It was quite different. I was brought up during the Third Reich. Along with my entire generation, I received an education of the highest ethical standards. We were brought up to love and respect our country and people. We were taught to be proud of its great history. The heroes of Germany's past represented our great ideals. They spurred us to honesty and responsibility in our own lives. In my opinion, the youth of Adolf Hitler's Germany was the finest of all Europe and perhaps of the entire world. The same ethical standards applied to the SS and SA. The SA Storm troopers were not sophisticated men. They usually preferred to use their fists before using their heads, but they acted according to the ideals which they had been taught: honour, faithfulness, honesty and devotion to their people and country. They were not at all the sadistic beasts portrayed by so-called historians. It was their faithfulness and gallantry which saved Germany from chaos and Communism. It is sheer stupidity to describe the SA men as blood-thirsty killers, as is widely done today. Although some individual SA men may have committed acts of brutality, it is nonsense to blame the entire organization or the whole German people and its government for such behaviour. Individual SA men were indeed involved in the Crystal Night incident. But far fewer actually participated than has been claimed. Of the 28 SA Groups which existed in Germany at the time, the available evidence identifies only three as having actually received orders to join the anti-Jewish demonstrations. Now let us look at what really happened during that fateful night. After 1945 any harm ever done to any Jew in National Socialist Germany has been described in great detail in many publications and combined with other.stories to give exaggerated figures which have then become the so-called “historical truth.” How strange it is then that despite the passage of more than forty years, no one has established the true extent of the damage done to the Jews during the Crystal Night. All one can learn from history writers is that “all” synagogues were demolished and that “all” shop windows were destroyed. Aside from this vague description, one is given almost no details. On the basis of the so-called “historical truth” about the Crystal Night, the President of the World Jewish Congress, Nahum Goldmann, had the chutzpah in 1952 to claim 500 million dollars from German Chancellor Konrad Adenauer as reparation payment for the damage done during that November night. When Adenauer asked Goldmann for his justification for this enormous request, Goldmann replied: “You find the justification yourself! What I want is not the justification but the money.” [note 7] And he got his money! Goldmann may have interpreted the willingness of the German Chancellor to pay a half billion dollars as proof for the claim that all synagogues had been destroyed. Why else would Germany be so foolish as to pay for something which never happened? 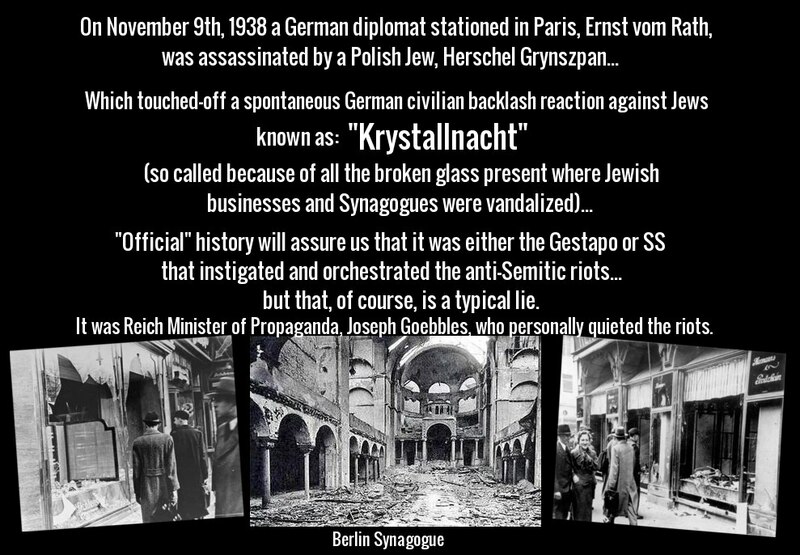 All the same, the “historical truth” that “all” German synagogues were destroyed is a lie. In 1938 there were approximately 1,400 synagogues in Germany, of which only about 180 were destroyed or damaged. Furthermore, Jews owned approximately 100,000 shops and department stores in Germany in 1938. Of this number, only about 7,500 had their windows broken. These figures show just how much the so-called “historical truth” differs from what actually happened. The damage and destruction that did actually occur was, of course, a terrible shame, but the exaggerations, especially by German historians who use them to condemn their own people, are also a shame. History writers tell us that during the Crystal Night all the Jews were frightened, meekly accepted whatever happened to them and watched the destruction of their property with no resistance. The contrary is true. While going through the files on this subject, I found many documents which report precisely just the opposite of what is claimed. The fact is that in many cases Jews and their German neighbours fought together against the attackers, pushing them down staircases. Street mobs were beaten up and chased away in more than one case. Police and Party officials were generally on the side of the Jews. Some Jewish community leaders went to police stations the next morning and asked the police to investigate the damage done to their synagogues. The resulting police reports are still available in the files today. How can such evidence be reconciled with the claim by Herman Graml, a prominent German historian and associate of the Munich Institute of Contemporary History, who wrote: “Every single Jew was beaten, chased, robbed, insulted and humiliated. The SA tore the Jews from their beds, mercilessly beat them in their apartments and then … chased them almost to death … Blood flowed everywhere.” [note 9] Is it conceivable that thousands of Jewish children would be have been sent to school by their parents on the morning after that fateful night if the attacks against Jews had been so horrific or extensive? Would any parents have let their children go to school if they had thought there was even the slightest danger of them being attacked by roving gangs of SA men? I think the answer is clearly no! Deplorable things did indeed happen which were bad enough, but the fantasies of modern historians and history writers such as Graml are simply inexcusable. It was Herschel Feibel Grynszpan (Gruenspan) who initiated the entire Crystal Night affair by shooting the Secretary of the German Embassy in Paris, Ernst vom Rath. History writers tell us that the 17-year-old Grynszpan was merely a poor Jewish boy who had been driven to despair by the injustice done to his family and who, in his deep depression, shot the young German diplomat. The fact, however, is that Grynszpan had not shown any previous interest in his family's fate. He had wanted to be free of them and had gone to Paris to live on his own. Version 1: He did not mean to kill vom Rath. He had wanted to kill the German ambassador but because he did not know the ambassador personally, he shot vom Rath instead by mistake. Version 2: He had only wanted to kill himself, but wanted to do so directly beneath a portrait of Adolf Hitler. In this way he hoped to become a symbol for the Jewish people, who were being murdered daily in Germany. Version 3: He had not intended to kill anyone. Although he had a pistol in his hand, he did not know how to handle it properly and it simply went off accidentally. Version 4: He could not remember what had happened while he stood in vom Rath's office. All he remembered was that he was there, but did not remember why. Version 5: He couldn't understand the question at all. He must have had a complete blackout because he no longer remembered anything. And finally, version 6, which he gave several years later to German officials: Whatever the French police had written down about his reason was nonsense. The true story is that he used to procure young boys for the German embassy secretary because vom Rath had been a homosexual. And he shot vom Rath because he had not been paid for his services. This is the only explanation which he later retracted during interrogation. However, none of these explanations is correct. The true story is far less heroic. Grynszpan had left his family in Hannover, Germany, in 1936 after finishing elementary school but without graduating. His father had been a piece-work tailor who had moved from Poland to Germany after the First World War. Herschel had a reputation for disliking work and he hung out at the homes of his uncles in Brussels and Paris. In February 1938 his Polish passport expired and the French government refused to renew his residence permit. As a direct result, his Paris uncle insisted that Herschel leave his home because he was afraid of getting into touble with the law. And now the story begins to get extremely interesting. Although Grynszpan had no job or money (his uncle refused to support him), he was nevertheless able to move into a hotel. His hotel happened to be just around the corner from the offices of an important and influential Jewish organization, the International League Against Anti-Semitism, or LICA. The questions which now arise are: Who supported him after February 1938 and who paid for his hotel room? Although he had no apparent means of support or even valid identity papers between February and November 1938, Grynszpan was nevertheless able to purchase a handgun for 250 francs on the morning of 7 November 1938 and then, about an hour later, go to the German Embassy and shoot vom Rath. Grynszpan was arrested at the scene and was taken to a police station. Although he was a totally obscure Polish Jew with no money and no apparent supporters, nevertheless one of France's most famous lawyers, Moro Giafferi, appeared at the police station a few hours after the shooting and told the police that he was Grynszpan's attorney. Nothing could possibly have appeared about the shooting in any newspaper before his arrival. How then could Moro Giafferi have possibly known about the shooting? Why was he so eager to defend this young foreigner? And finally, who was going to pay his attorney fees? As it turned out, Giafferi took good care of Grynszpan during the following years. Before the Grynszpan case could come before a French court, the war broke out. After the Germans occupied France, he was turned over to them by the French authorities. He was taken to Germany where he was interrogated many times, but no trial ever took place. Moro Giafferi, who had moved to Switzerland in the meantime, still managed to take good care of Grynszpan. Many German officials were actively interested in the case. They wanted Grynszpan brought to trial, but this never happened. Rumours circulated. A trial date was scheduled but then postponed again and again and again. Whenever any official asked why Grynszpan had not been brought to trial, he was given a different answer each time. The veil of mystery surrounding this case was lifted only slightly many years after the war when a note was discovered among the many hundreds of pages in the Grynszpan file. This single short note stated simply that the trial against Grynszpan would not take place for “other than official reasons.” [note 10] It gave no further explanation. Although the National Socialist regime supposedly committed the greatest imaginable crimes against the Jews, the murderer Grynszpan survived the war and returned to Paris. Why to Paris, where he could still have been arrested and tried for murder? But instead he received a new name and new identity papers there. [note 11] From whom? Who was in Paris to help him and once again take such good care of him? Incidentally, the Grynszpan family also survived the war. The young man's father, mother, brother and sister were deported to Poland as a result of the Polish passport affair and shortly thereafter were somehow able to emigrate to Palestine. Amazingly enough, this took place at a time when immigration to Palestine was limited to persons who possessed at least 1,000 English pounds in cash. Grynszpan's father, a poor piece-work tailor, certainly never had a fortune of 4,000 English pounds. Many years after the war the father testified at the Eichmann trial in Jerusalem that he and his family had to give up all of their money except for ten marks per family member when they arrived at the German-Polish border in October l938. [note l2] How did they ever raise the 4,000 English pounds only a short time later for their migration to Palestine? Who organized their move? Perhaps the answer to all of these questions is … Moro Giafferi! He was not a sorcerer, but someone even more powerful: he was the legal counsel of the LICA. The LICA was founded in Paris in 1933 by the Jew Bernard Lecache and operated as a militant propaganda organization against real or imagined anti-Semitism. Its main office is still in Paris at the same address it was at in 1938. (Now known as the LICRA, it unsuccessfully sued Robert Faurisson a few years ago.) Moro Giafferi was well worth the fees LICA paid him as its legal counsel. He apparently enjoyed spectacular scenes. He had already achieved international renown at a mass meeting in Paris following the Berlin Reichstag fire of February 1933. Without knowing at all what had happened, he nevertheless delivered a spiteful speech against National Socialist Germany in which he accused Hermann Göring of setting the fire. In February 1936 Giafferi hurried to Davos, Switzerland, where the Jew David Frankfurter had shot and killed Wilhelm Gustloff, the head of the Swiss branch of the German National Socialist Party. During the subsequent trial it was clearly established that Frankfurter had been a hired murderer with backing from an unidentified but influential organization. All clues pointed to the LICA, but with Moro Giafferi as his defence counsel, Frankfurter remained silent about who, if anyone, had hired him. Amazingly enough, Frankfurter's answers to questions about the shooting showed the same pattern as Grynszpan's answers almost three years later after Giafferi arrived to help following the shooting of Ernst vom Rath. Who Could the Provocateurs Have Been? Like a medal, the Crystal Night has two sides. One side lies in the shining glare of historical research while the other remains in the shadows. Until now no one (at least as far as I know) has tried to examine the hidden side. In the wake of the Crystal Night, almost everyone wanted to know who the culprits were. Dr. Goebbels had to give an official explanation which was, in effect, that the German people had been so enraged by the murder of Ernst vom Rath that they wanted to punish the Jews and therefore started the pogrom. But Goebbels did not really believe this story himself. To several persons he expressed his suspicion that a secret organization must have instigated the entire affair. He simply could not believe that anything so well organized could have been a spontaneous popular outburst. One must understand the broad popularity of the National Socialist regime at that time to realize how incredibly difficult it was to imagine that any secret, well organized opposition movement could have instigated such a pogrom. We now know about some of these so-called resistance organizations. But at that time such well-organized opposition groups seemed preposterous, so overwhelming was the popularity and self-confidence of Hitler and the National Sociatist government. Although the National Socialists were probably more aware of the danger of Jewish power and influence than anyone else, they nevertheless totally underestimated it. In a real sense, they were far too naive. One consequence of this enormous popularity and self-confidence was that the Party leaders themselves simply could not imagine that it was not one of their own colleagues behind the whole affair. Among the Party leaders fingers were being pointed in all directions. Apparently to avoid internal wrangling and the harm that this would do to their public image, an investigation to determine the instigators never took place. Hitler believed that Dr. Goebbels, his closest confidant and the one man he could never abandon, had been the instigator. The only persons actually punished were individual SA men who had participated directly in the pogrom and been accused in German courts of murder, assault, looting or other criminal acts by Jewish or German witnesses to these crimes. But before any of these cases ever actually came to trail, Hitler issued a special decree ordering the postponement of all such cases until after the accused individuals were first prosecuted by the Supreme Party Court, an internal court concerned with discipline within the National Socialist Party organization. The most severe punishment which the Court could impose was expulsion from the Party. In this way the Party hoped to remove any guilty members from its own ranks before they appeared as defendants in the criminal courts. In February 1939 the Chief Judge of the Supreme Party Court, Walter Buch, reported his findings to Hermann Göring. From an examination of the Buch report as well as many documents from some of the thousands of trials of so-called Nazi criminals held after the war, and corroborating testimony by thousands of defendants and witnesses, I have been able to gain a detailed and accurate understanding of what actually happened during those fateful days and nights of November 1938. Already on 8 November 1938, one day before the Crystal Night, strange persons who had never been seen there before suddenly appeared in several small towns in Hessen near the French-German border. They went to mayors, Kreisleiters (district Party leaders) and other important officials in these towns and asked them what actions were being planned against the Jews. The officials were rather startled by these questions and replied that they didn't know of any such plans. The strangers acted as if they were shocked to hear this. They shouted and complained that something had to be done against the Jews and then, without further explanation, they disappeared. Most of those who were approached by these strangers reported the incidents to the police or discussed them with friends. They usually regarded the strangers as crazy anti-Semites and promptly forgot about the incidents — until the next evening. Some of these apparently crazy individuals really outdid themselves. In one case two men, dressed as members of the SS, went to an SA Standartenführer (Colonel) and ordered him to destroy the nearby synagogue. To understand the absurdity of this one must know that the SS and SA were completely separate organizations. A real SS member would never have tried to give orders to an SA unit. This case shows that the strangers were foreigners who did not even understand the distinctions of German authority. The SA Standartenführer rejected the demands of the self-styled SS men and reported the incident to his superiors. When the provocateurs realized that their efforts were not working with local officials, they changed their tactics. Instead they tried to incite directly the people in the streets. In another town, for example, two men appeared at the market place and began making speeches to the people there, trying to incite them against the Jews. Eventually some people did indeed storm the synagogue, but by then the two provocateurs had, of course, disappeared. Similar incidents occurred in several towns. Unidentified strangers suddenly appeared, gave speeches, started throwing stones at windows, stormed Jewish buildings, schools, hospitals, and synagogues, and then disappeared. These unusual incidents had already started on the 8th of November, that is, before Ernst vom Rath was dead. His death was only reported late on the evening of the 8th. The fact that this strange pattern of incidents had already begun one day earlier proves that the death of vom Rath was not the reason for the Crystal Night outburst. Vom Rath was still alive when the pogrom began. And this was only the beginning. Well organized and widespread incidents began on the evening of 9 November. Groups of generally five or six young men, armed with bars and clubs, went down the streets smashing store windows. They were not Jew-hating SA men, enraged over the murder of a German diplomat. They operated too methodically to have been motivated by anger. They carried out their work without any apparent emotion. Nonetheless, it was their destruction that encouraged certain other individuals from the lowest social classes to become a mob and continue the destruction. There is another mysterious aspect to all this. Several district and local Party leaders (Kreisleiters and Ortsgruppenleiters) were awakened from their sleep in the middle of the night by telephone calls. Someone claiming to be from the regional Party headquarters or the regional Party propaganda bureau (Gauleitung or Gaupropagandaleitung) would ask what was happening in the official's town or city. If the Party official answered “Nothing, everything is quiet,” the telephone caller would then say in German slang that he had received an order to the effect that the Jews were going to get it tonight and that the respective official should carry out the order. In most cases the Party leader, disturbed from his sleep, did not even understand what had happened. Some simply dismissed the call as a joke and went back to bed. Others called back the office from where the telephone voice had pretended to be calling. If they managed to reach someone in charge, they were often told that nobody knew anything about such a call. But if they reached only a lower official they were often told: “Well, if you got that order, you'd better go ahead and do what you were told.” These telephone calls caused considerable confusion. All this came out months later during the trials conducted by the Supreme Party Court. The Chief Judge concluded that in every case a misunderstanding had arisen in one link or other of the chain of command. But when they were confronted with apparently genuine orders to organize demonstrations against the Jews that night, most of the Party leaders had simply not known what to do. The pattern of seemingly sporadic anti-Jewish incidents in small towns, followed only later by a carefully planned outburst in many large cities throughout Germany, clearly suggests the work of a centrally organized group of well-trained agents. Even shortly after the Crystal Night, many leading Party officials suspected that the entire affair had been centrally cordinated. Significantly, even Hermann Graml, the only West German historian who has written in detail about the Crystal Night, carefully distinguished between provocateurs and people who were simply carried away by their emotions and spontaneously took part in the riot and destruction. Without providing the slightest shred of real evidence, Graml claims that the provocative agents were directed by Dr. Goebbels. While all this was happening across the Reich, a special annual commemoration was being held in Munich. Fifteen years earlier, on 9 November 1923, a movement led by Adolf Hitler, Erich von Ludendorff (a leading First World War General), and two major figures in the Bavarian government tried to depose the legal government and take responsibility themselves as a new national government. The uprising or putsch was put down and 16 rebels were shot down next to the Feldherrnhalle, a famous old monument building in central Munich. Accordingly, the 9th of November had been commemorated every year since 1933 as the memorial day for the martyred heroes of the National Socialist movement. Adolf Hitler and the Party veterans, as well as all of the Gauleiters (regional Party leaders) met every year in Munich for the occasion. Hitler would usually deliver a speech to a select audience of Party veterans at the famous Buergerbraeukeller restaurant on the evening of the 8th. On the morning of the 9th Hitler and his veteran comrades would reenact the 1923 “March to the Feldherrnhalle.” On the evening of the 9th the Führer always held an informal dinner at the Old Town Hall (“Alte Rathaus”) with old comrades as well as all the Gauleiters. At midnight young men who were about to enter the SS and the SA were sworn in at the Feldherrnhalle. All of the Gauleiters and other guests participated in this very solemn ceremony. After it was over they left Munich and returned to their homes throughout the Reich. It is clear that the 8th of November date was chosen very cleverly. The annual commemoration ceremony of that day insured that almost all of the Gauleiters would be away from their home offices when the anti-Jewish demonstrations began. In other words, the actual decision-making responsibilities that were normally carried out by the Gauleiters were temporarily in the hands of lower-ranking individuals with less experience. Between 8 and 10 November, subordinate officials stood in for the Gauleiters who were either in Munich or en route to or from the annual commemoration there. This temporary transfer of decision-making authority is very important because it contributed to much of the subsequent confusion and thus helped the provocateurs. Another contributing factor was the fact that no one expected any trouble. At that time Germany was one of the most peaceful countries in the world. There was no reason to expect any kind of unrest. It was only during dinner at the Old Town Hall that the first sporadic reports of riot and destruction reached Munich from some of the Gauleiter's home offices. At the same time it was learned that Ernst vom Rath had died in Paris from his wounds. After the dinner was over, the Führer left at about 8 p.m. and returned to his apartment. Dr. Goebbels then stood up and spoke briefly about the latest news. He informed the audience that vom Rath had died and that, as a result, anti-Jewish demonstrations had spontaneously broken out in two or three places. Goebbels was renowned for his passionate and inspiring speeches. But what he gave that evening was not a speech at all but only a short and very informal announcement. He pointed out that the times were over when Jews could kill Germans without being punished. Legal measures would now be taken. Nevertheless, the death of vom Rath should not be an excuse for private actions against Jews. He suggested that the Gauleiters and the head of the SA, Viktor Lutze, should contact their home offices to make sure that peace and order were being maintained. It's very important to understand that Dr. Goebbels had no authority to give any orders to the others present. As fellow Gauleiters they were colleagues of equal rank. Anyway, what he said was apparently considered so reasonable that the others agreed and did what he suggested. As Gauleiter for Berlin, Dr. Goebbels had no authority outside of his Berlin district. Although he was also the Propaganda Minister of the German government, this did not give him any authority over Party officials. Furthermore, he had no authority whatsoever over the SA or the SS. Of all the National Socialist leaders, Dr. Goebbels would have understood better than anyone else the immense damage that an anti-Jewish pogrom would cause for Germany. On the morning of 10 November, when he first learned about the extent of the damage and destruction of the previous night, he was furious and shocked at the stupidity of those who had participated. There is substantial evidence for this. How could a speech given after 9 p.m. on the evening of 9 November have possibly incited a “pogrom” which had already begun the day before when the first provocateurs appeared at municipal and Party offices to persuade officials to take action against the Jews? Although we do not know exactly what Dr. Goebbels said in his supposedly fiery speech, we do know what the Gauleiters and the SA commander did after the speech had ended: they went to the telephones and called their respective home offices to order their subordinates to do everything necessary to maintain peace and order. They emphasized that under no circumstances must anyone take part in any demonstrations. These telephone instructions were written down at the home offices by whoever was on duty. The orders from each Gauleiter were then passed on by telex to other offices within the Gau or district. These telex messages are still in various records files and are available to anyone who wishes to examine them. While the Gauleiters were calling their home offices, the head of the SA, Viktor Lutze, ordered all of his immediate subordinates, the SA Gruppenführers, who were together with him in Munich, to call their home offices as well. Lutze ordered that under no circumstances could SA men take part in any demonstrations against Jews, and that furthermore the SA was to intervene to stop any demonstrations already in progress. As a result of these strict orders, SA men began to guard Jewish stores that very night wherever windows had been broken. There is no doubt about this order by Lutze because we have the postwar court testimony of several witnesses confirming it. The SS and the police were given similar orders to restore peace and order. Himmler ordered Reinhard Heydrich to prevent all destruction of property and to protect Jews against demonstrators. The telex communication of this order still exists. It is in the files of the International Military Tribunal in Nuremberg. However, during the Nuremberg trial this telex order was presented in three different forms, with forged amendments to change the original meaning. In my book Feuerzeichen I undertook to restore the original text. Adolf Hitler joined the midnight celebration at the Feldherrnhalle. It was only after he returned to his apartment about one o'clock in the morning that he learned about the demonstrations which had been taking place in Munich, during which one synagogue had been set on fire. He was furious and immediately ordered the police chief of Munich to come see him. Hitler told him to immediately stop the fire and to make sure that no other outrages took place in Munich. He then called various police and Party officials throughout the Reich to learn the extent of these demonstrations. Finally, he ordered a telex message sent to all Gauleiter offices. It read: “By express order from the very highest authority, arson against Jewish businesses or other property must in no case and under no circumstances take place.” Synagogues were not specifically mentioned, apparently because Hitler was still unaware of the burning of synagogues, apart from the one in Munich. How Did the SA Get Involved Despite the Orders from Its Own Leaders? How was it possible that in spite of all these emphatic orders, so much damage and destruction could have been done and that so many SA members could have participated? According to the records, at least three of the 28 SA Groups did not obey the orders of SA chief Lutze. Instead, they sent out their men to destroy synagogues and Jewish buildings. In effect they did precisely the opposite of what Lutze had ordered. What actually happened is clear from the testimony and evidence presented at postwar trials against former SA men accused of participating in the riot. The trials, held between 1946 and 1952, were based to a large extent on the report of SA Brigade 50 chief Karl Lucke and begins with these words: “On 10 November 1938, at 3 o'clock in the morning, I received the following order: ‘By order of the Gruppenführer, all Jewish synagogues within the Brigade district are to be immediately blown up or set on fire'.” Lucke then included in his report a listing of synagogues which had been destroyed by members of his Brigade. This report has been cited by the prosecution at the Nuremberg Tribunal and by practically all of the consensus historians ever since as proof that the SA was given orders to destroy Jewish stores and synagogues. The contradiction between the orders actually given and the statement made in the Lucke report requires a detailed explanation. On 9 November the leader of SA Group Mannheim, Herbert Fust, was in Munich together with the other SA Group leaders and the SA Chief of Staff, Viktor Lutze. When Lutze ordered the Group leaders to contact their home offices to stop all anti-Jewish demonstrations, Fust, along with the other SA leaders, did just that. He called his office in Mannheim and passed on the orders he had received from Lutze. The man who was on duty that night at the Mannheim SA office telephone and who received Fust's order confirmed that he understood it and then hung up. But he never passed on the order he had received. Instead, he transmitted precisely the opposite order. The normal procedure would have been for the man on duty at the telephone to immediately call the deputy group leader, Lucke, who was in nearby Darmstadt. But instead he called SA Oberführer (senior colonel) Fritsch and asked him to come to the office. Fritsch had a reputation for not being particularly clever. When he arrived, the man who had received the telephone call showed him a small paper slip with a few notes on it which said that the synagogues within the Mannheim SA Group district were to be destroyed. The man who had received the call explained to Fritsch that the order had just arrived from Munich. Slow-minded as he was, Fritsch did not know what to do and called the local Kreisleiter (district Party leader) and his deputy. These two men then arrived at the SA office and discussed the situation, while at the same time the telephone duty man notified other SA leaders, but still not the deputy Group leader Lucke. In the meantime the small paper slip disappeared and the SA men now arriving at the headquarters met only the Kreisleiter, who told them about the order which he thought had come from Munich. No one asked for any further confirmation. The SA men then left to begin the destruction. Hours later, when the whole action was almost finished, the telephone guard finally called Deputy Group Leader Lucke and passed on the false order. He also informed Lucke that the action had already been going on for several hours. Since it was almost all over by this time, Lucke also neglected to ask for confirmation of the order. It was already 3 o'clock in the morning. Lucke then alerted the Standartenführer of his Brigade and carried out the destruction within the Darmstadt district. At 8 o'clock the next morning Lucke sat down and wrote the report which was later cited at the Nuremberg Tribunal. In fact, as already shown, there was no order to commit arson or carry out destruction against any Jewish property from the Gruppenführer in Munich, but only from the telephone guard. Who he was remains a mystery. During the postwar trials against members of this SA unit, none of the judges asked for the name or identity of this telephone guard. This mysterious man was very probably an agent for those who were actually behind the entire Crystal Night Affair. Early in the morning following the Crystal Night, Propaganda Minister Dr. Goebbels announced in a radio broadcast that any action against Jews was strictly prohibited. He warned that severe penalties would be imposed on anyone who did not obey this order. He also explained that the Jewish question would be resolved only by legal means. As already mentioned, German government and Party officials were furious about what had happened. Hermann Göring, who was responsible for Germany's economy, complained that it would be impossible to replace the special plate glass of the broken store windows because it was not manufactured in Germany. It had to be imported from Belgium and would cost a great deal of precious foreign currency. Because of the Jewish boycott against German goods, the Reich was short of foreign exchange currency. Göring therefore decided that because this shortage was caused by the Jews, it was they who would have to pay for the broken glass. He imposed a fine of one billion Reichsmarks on the German Jews. This fine is always mentioned by anyone who writes about the Crystal Night. But historians and history writers invariably neglect to explain the reason for the fine. It was certainly unjust to force Jews to pay for damage which they had not caused. Göring understood this. However, in private he justified the fine by citing the fact that the 1933 Jewish declaration of war against Germany was proclaimed in the name of the millions of Jews throughout the world. Therefore they could now help their co-religionists in Germany bear the consequences of the boycott. It should also be pointed out that only German Jews with assets of more than 5,000 Reichsmarks in cash had to con- tribute to the fine. In 1938, when prices were very low, 5,000 Reichsmarks was a small fortune. Anyone with that much money in cash would certainly have had far more wealth in other assets and could therefore well afford to pay their assessed portion of the fine without being reduced to poverty, despite what history writers have maintained. It is often said that the Crystal Night incident was the official start of the German “Final Solution of the Jewish Question.” This is quite true, but “Final Solution” did not mean physical extermination — it meant only emigration of the Jews from Germany. Immediately after the Crystal Night, Hitler ordered the creation of a central agency to organize the emigration of the Jews from Germany as rapidly as possible. Accordingly, Göring set up the Reich Central Office for Jewish Emigration (“Reichszentrale fuer die juedische Auswanderung”) with Reinhard Heydrich as director. This agency combined the various government departments which had been involved with Jewish emigration. It simplified official procedures for Jewish emigration, but its work was severely hampered by the unwillingness of almost all countries to admit Jews. The only country to which Jews could still easily emigrate was Palestine, provided they possessed one thousand pounds sterling each, as required by the British authorities there. Despite the favorable terms of the Haavara or Transfer Agreement, only a few German Jews were willing to emigrate to Palestine. In those days Palestine was only at the beginning of its development. It was still an agrarian country with very little industry. It was only after the arrival of thousands of German Jews with their capital and experience that industrial development really began there. The Jews in Germany were generally employed in trade, industry, or the professions. There were little or no opportunities for them in Palestine. For example, there was virtually no financial structure in Palestine in the 1930s. There was no money market, no stock exchange, and no investment banking. How could businessmen operate in such an environment? Because so few Jews wanted to migrate to Palestine, special efforts were made to open the doors of other countries, but this proved very difficult. Prosperous nations did not want Jewish immigrants and poor countries were very unattractive. In the summer of 1938 an Inter-Governmental Refugee Committee was established with the American lawyer George Rublee as its director. In January 1939 (that is, after the Crystal Night), Rublee and the German government signed an agreement by which all German Jews could emigrate to the country of their choice. Interestingly enough, it was the father of a future American president and the father of a future German president who nearly torpedoed this agreement: Joseph Kennedy, the U.S. Ambassador to Britain, and Ernst von Weizsaecker, State Secretary of the German Foreign Office and father of the current president of the German Federal Republic. Adolf Hitler personally intervened in the negotiating process and saved the agreement by sending Reichsbank President Hjalmar Schacht to London to negotiate with Rublee. Rublee himself later called it a “sensational agreement” — and it was indeed sensational. Special arrangements between the Inter-Governmental Committee and governments of individual countries would guarantee the financial security of the migrating Jews. Training camps would be established to prepare emigrating Jews for new jobs in their future homelands. Jews in Germany who were more than 45 years old could either emigrate or remain in Germany. If they decided to remain, they would be exempt from discriminatory restrictions. They would be able to live and work wherever they wanted. Their social security would be guaranteed by the Reich government, the same as for any German citizen. As Rublee later noted, there were practically no incidents against Jews during the time between the signing of the agreement and the outbreak of war in September 1939. The Reich Central Office for Jewish Emigration, which was organized shortly after the Crystal Night, was based on the provisions of the Rublee plan. A parallel Jewish organization, the Reich Union of Jews in Germany (“Reichsvereinigung der Juden in Deutschland”), was established. Its task was to advise Jews on all questions of emigration and to act on behalf of Jews with the Reich Central Office. The two agencies worked closely together to facilitate Jewish emigration as much as possible. In addition, the SS and certain other National Socialist organizations worked with Zionist organizations to facilitate Jewish emigration. Jewish groups greatly appreciated the cooperation of the SS. For example, the SS established training centres where prospective Jewish emigrants learned new job skills to prepare them for their new lives. With the help of the Transfer Agreement and the Rublee plan, hundreds of thousands of Jews migrated from Europe to Palestine. In September 1940 the Jewish news agency in Palestine, “Palcor,” reported that 500,000 Jewish emigrants had already arrived from the German Reich, including Austria, the Sudetenland, Bohemia- Moravia, and German-ruled Poland. Nevertheless, after 1950 it was claimed that the total number of Jewish emigrants to Palestine from all European countries was only about 80,000. What happened to the other 420,000 Jews? In 1940 they probably had no idea that later on they were supposed to have been “gassed”! I have tried to point out just a few unmentioned aspects of the Crystal Night issue which, in my opinion, give a picture of what actually happened that is entirely different than the one generally accepted. I am convinced that neither the German government nor the leaders of the National Socialist Party instigated the Crystal Night. Ultimately it was not the Jews but the Germans who suffered most as a result of this event. Even persons sympathetic to National Socialism are still appalled when they think of the Crystal Night. Many are under the impression that murder and arson were quite common under National Socialism and that no Jew could be sure of his life or property. Nazi Germany was supposedly a country without any civil rights. The Crystal Night incident was indeed one of the darkest episodes of German history in the era of 1933 to 1945. But based on all of the available evidence, these demonstrations were neither thought up nor organized by German Party or government officials. In fact, they were completely surprised and shocked when they learned of the riot and destruction. The pogrom must have been thought up and organized by those who actually benefited from it and who wanted to create havoc in Germany. Who could they have been? If we keep in mind the deep involvement of the Jewish organization LICA in the murder of vom Rath, we may ask: Could the Jews themselves have hoped to benefit from a pogrom? In the aftermath of the Crystal Night, the world press became overwhelmingly sympathetic to the Jews, which is precisely what they wanted above all else. The Zionists in particular counted on worldwide support in their struggle against England, which then ruled Palestine as a British mandate. Jewish immigration to Palestine was strictly limited at that time by the British because of vehement Arab opposition to the arrival of ever larger numbers of Jews. As a result, the number of Jewish immigrants dropped in 1938 to the lowest level since the beginning of the century, when the Zionist mass migration to Palestine began. To stabilize the situation, the British formulated a partition plan dividing Palestine into Arab and Jewish portions. Despite serious reservations, the Jews agreed to the plan, but the Arabs did not. They responded with an uprising known as the Arab Revolt. In March 1938 the British government sent Sir Harold MacMichaels as High Commissioner to Palestine. He succeeded in suppressing the uprising, but to appease the Arabs he promised to urge his government to abandon the partition plan and halt further Jewish immigration. MacMichaels returned to London in October 1938 to discuss his proposals with the British parliament. The scheduled date for the final decision was 8 November 1938, the day on which the Crystal Night violence actually began. German Embassy Secretary Ernst vom Rath had been shot just one day earlier, on 7 November. The conspirators no doubt hoped that vom Rath would die immediately, in which case the anti-Jewish demonstrations would probably have also started on the 7th. Could someone have hoped that a pogrom in nearby Germany would influence the British to change their Palestine policy? Or that it would induce the outside world to exert pressure on Britain to open Palestine to the Jews who were being so terribly treated in Germany? I cannot give any definite answers. I can only speculate as to who conspirators behind the Crystal Night really were and as to their motives. To me it seems entirely plausible that certain Jewish groups were involved. The LICA was almost certainly involved in the murder of vom Rath. In any case, the Crystal Night incident was not an expression of the will of the German people. Nor was it organized by Dr. Goebbels or any of the other German leaders. On the contrary, it was carefully organized by people who worked in the shadows. 1.William P. Varga, The Number One Nazi Jew-Baiter: A Political Biography of Julius Streicher (New York: 1981). 2. Even Helmut Heiber, a prominent contemporary German historian, had to admit these facts. Helmut Heiber, “Der Fall Gruenspan,” ViertelFahrshefte für Zeitgeschichte, 5. Hg., 1957, pp. 154-172. 4. Ingrid Weckert, Feuerzeichen: Die “Reichslcristallnacht,” Anstifter und Brandstifterpfer und Nutzniesser (Tuebingen: 1981), p. 225. 5. Edwin Black, The Transfer Agreement, p. 382. 6. W. Feilchenfeld, et al., Haavara-Transfer Nach Palaestina, p. 71. 7. Nahum Goldmann, Das Juedische Paradox: Zionismus und Judentum nach Hitler (Cologne: 1978), p. 181. 8. Heinemann Stern, Warum Hassen Sie Uns Eigentlich? (Duesseldorf: 1970), pp. 298-299. 9. Hermann Graml, Der 9. November 1938 (Bonn: 1958), p. 47. 10. H. Heiber, “Der Fall Gruenspan,” p. 164. 11. H. Heiber, “Der Fall Gruenspan,” p. 172. 12. Gideon Hausner, Justice in Jerusalem (New York: 1968), p. 41. From The Journal of Historical Review, Summer 1985 (Vol. 6, No. 2), pages 183-206. This item was first presented at the Sixth IHR conference, February 1985, in Anaheim, California. Ingrid Weckert is the author of a detailed examination of “Crystal Night” and German-Jewish relations during the 1930s that was published as a book in Germany in 1981 under the title Feuerzeichen, and in the USA in 1991 under the titleFlashpoint. At the end of the Second World War Weckert was a teenager in devastated Berlin. After Gymnasium graduation she studied theology, including Judaic studies, in Switzerland. She deepened her understanding of the history and character of the Jewish people during numerous visits to Israel. Frau Weckert lived for years in Munich, where she worked as a librarian, and then devoted considerable time to historical research and writing.